Dulverton Junior School and All Saints CofE Infant School were honoured to welcome GB inline vert skater, Rich Parker, to the school on Friday 5th October. Rich has won many accolades including a silver medal in the X-Games. The day was organised by Miss Ahern and Mrs Drummond (PE co-ordinators), alongside the Sports for School organisation who run athlete-led physical activity events to inspire children, raise money for PE equipment in schools (over £2.5m to date), and support GB and Irish Olympic, Paralympic and Invictus athletes financially. 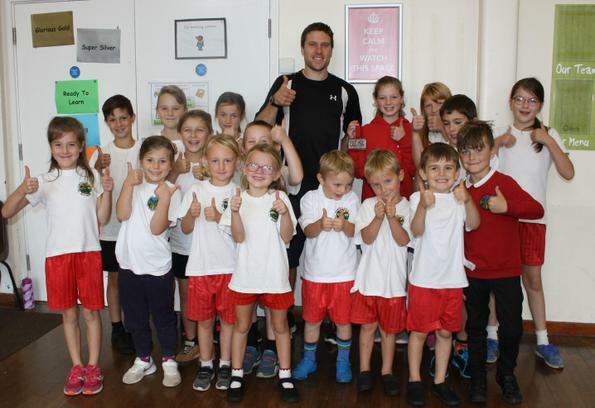 The school was alive with energy, noise, smiling, happy faces and a sense of achievement as the children worked together through a sponsored fitness circuit, led by Rich Parker himself. Pupils completed a range of exercises from spotty dogs, to press ups, star jumps to leg drives. 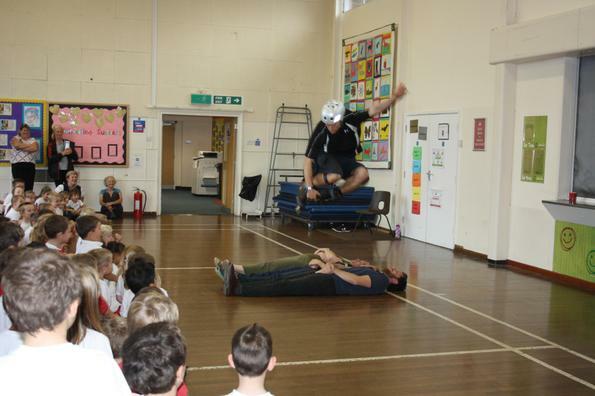 Upon completion of the fitness activities, pupils gathered in the school hall for an assembly, where they could rest and listen to Rich speak about his individual sporting experiences, the lessons that he has learned in life, and watch a spectacular demonstration of his skating skills – including a skating jump over three brave teachers! The aim of the event was to inspire the pupils to take up sport, but just as importantly to encourage them to discover and then pursue their passion in life.